"A self-conscious bride is tormented by the memory of her husband's dead first wife." Although I'm the first to admit that I'm not much of a Hitchcock expert, this Oscar winning gothic thriller seems ideal (at least atmospherically) for my second recommendation in the run up to Hallowe'en. There's not much I can tell you which you can't find out for yourself by Googling or reading Wikipedia, as it all seems fairly typical of an Alfred Hitchcock wartime film noir to me. 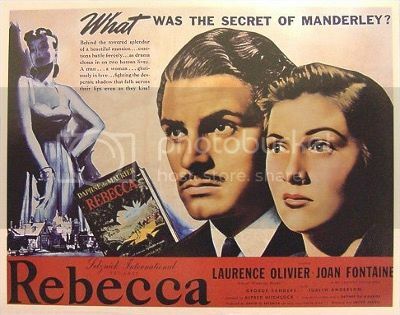 "Rebecca" was Hitchcock's first American movie and his second adaptation of a book by Cornish author Daphne du Maurier. Apparently, David Selznick wasn't happy with losing control as producer to the whims of Alfred Hitchcock and reshot several scenes, but I have no clue what they were or even if it matters that much. The movie ran way over budget for all kinds of reasons, and I don't think anyone involved was completely happy with it either during or after production. Much like any other movie of the time, "Rebecca" is all very dated with mostly awful overacting and line delivery, and effects such as rear projection during the driving scenes are glaringly obvious. There's even what appears to be roadkill in the background of the second day out in Monte Carlo (actually California) with Maxim and the future Mrs de Winter. "There will only be 8 planets left... after I destroy Uranus." 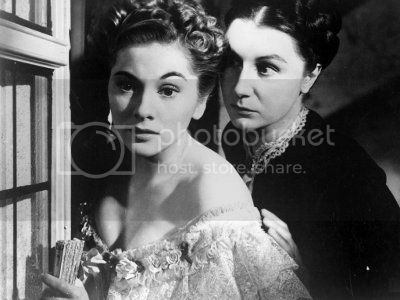 With several changes to the original novel by Daphne du Maurier, the standout amd most memorable character becomes the sinister housekeeper Mrs Danvers (as played by Judith Anderson) rather than the romantic leads. Danvers is quite the looker, hardly ever blinks, and has the worst kind of fangirl crush on the dead former mistress of the house. Weirdly, we never get to see the titular Rebecca de Winter in flashbacks, and have to learn nearly everything about her from the rose-tinted memories of her obsessed servant. But just like the novel, the new Mrs de Winter doesn't even get a first name. The only big problem with "Rebecca" is that it's hard to care about any of the characters other than Laurence Olivier's cuckolded Maxim, and to some extent, George Sanders as the opportunistic adulterer Max Favell. A very young Joan Fontaine is simply far too mousey, awkward, and scared of her own shadow as she comes to terms with her new position among the upper classes to be a sympathetic character for modern audiences who have never encountered domestic service themselves. Except for period TV dramas such as "Upstairs Downsatirs" and "Downton Abbey", I'm glad to say that I've never had much to do with the antiquated British feudal system either. What makes "Rebecca" worth watching for its two-hour duration is the set design for the interiors of Manderley, the atmosphere, and the anticipation of revelations with a twist. Getting there may not be worth the trouble for some people (including anyone who has seen or heard any of the remakes and clones), but as a precursor to "The Uninvited" (1944)—an equally dated ghost story which I've often recommended for Hallowe'en—it's certainly interesting to see how certain moral codes were only everso slightly more relaxed four years later. Due yet another remake any time now, "Rebecca" is still worth checking out if you don't want to wait. 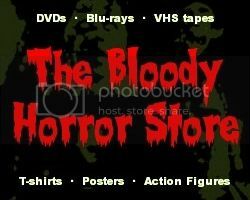 A certain British newspaper gave away barebones DVDs of the movie several years ago (which you can now pick up for pennies on eBay), and of course, it's been uploaded all over the internet streaming sites (despite not being officially in the Public Domain as far as I know) for those who want to search for it. As an old black and white movie, I don't know if there's any benefit in buying a blu-ray version, but I'm sure at least one exists. The existing DVDs have several grainy moments near the end which could be the result of an intentional effect shot through a piece of net (perhaps to simulate fog or smoke), but they are all good enough for most people.